Your Price: $44.99 - NEW RELEASE, THE OTHER SIDE BY WYRD! Most Abyssinians who serve in the military spend at least a portion of their enlistment as Crow Runners. 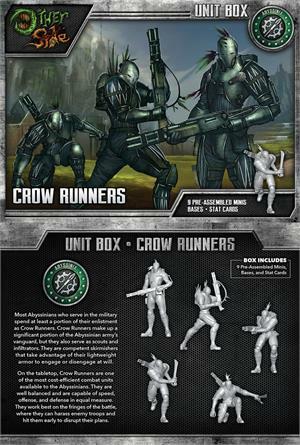 Crow Runners make up a significant portion of the Abyssinian army's vanguard, but they also serve as scouts and infiltrators. They are competent skirmishers that take advantage of their lightweight armor to engage or disengage at will. 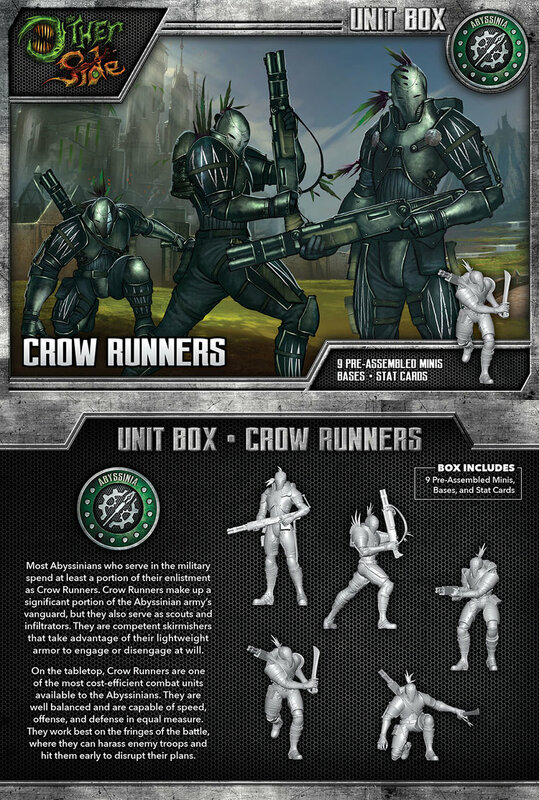 On the tabletop, Crow Runners are one of the most cost-efficient combat units available to the Abyssinians. They are well balanced and are capable of speed, offense, and defense i n equal measure. They work best on the fringes of the battle, where they can harass enemy troops and hit them early to disrupt their plans.